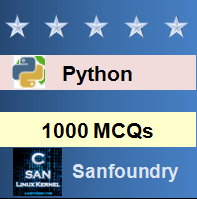 This set of Python Multiple Choice Questions & Answers (MCQs) focuses on “Lists”. 1. Which of the following commands will create a list? 2. What is the output when we execute list(“hello”)? a) [‘h’, ‘e’, ‘l’, ‘l’, ‘o’]. 3. Suppose listExample is [‘h’,’e’,’l’,’l’,’o’], what is len(listExample)? Explanation: Execute in the shell and verify. 4. Suppose list1 is [2445,133,12454,123], what is max(list1) ? Explanation: Max returns the maximum element in the list. 5. Suppose list1 is [3, 5, 25, 1, 3], what is min(list1) ? Explanation: Min returns the minimum element in the list. 6. Suppose list1 is [1, 5, 9], what is sum(list1) ? Explanation: Sum returns the sum of all elements in the list. 7. To shuffle the list(say list1) what function do we use ? Explanation: Execute in the shell to verify . 8. Suppose list1 is [4, 2, 2, 4, 5, 2, 1, 0], Which of the following is correct syntax for slicing operation ? Explanation: Slicing is allowed in lists just as in the case of strings. 9. Suppose list1 is [2, 33, 222, 14, 25], What is list1[-1] ? Explanation: -1 corresponds to the last index in the list. 10. Suppose list1 is [2, 33, 222, 14, 25], What is list1[:-1] ? a) [2, 33, 222, 14]. d) [25, 14, 222, 33, 2].